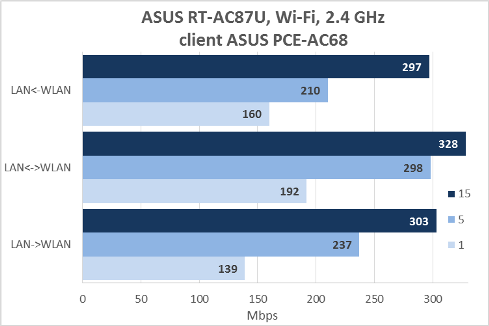 We couldn't yet get accustomed to the speeds of wireless routers that support AC1900 when ASUS company surprised us with a new router, RT-AC87U, with support of AC2400, which allows for raising the level of wireless speeds up to staggering 2334 Mbps. 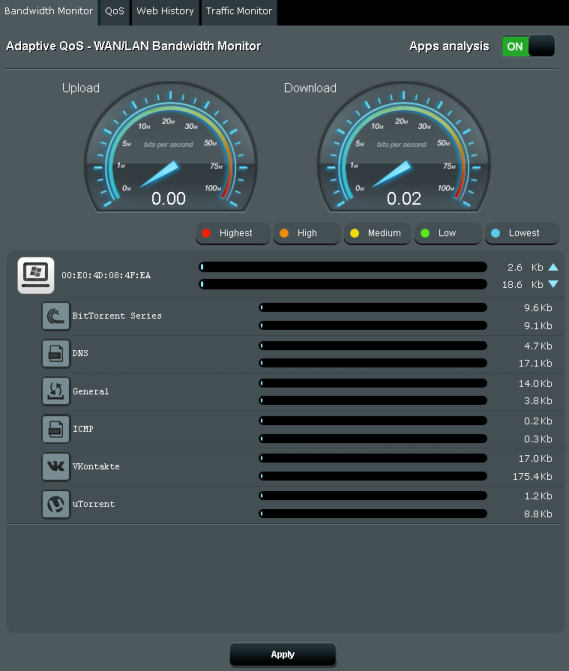 In this review we will try to find out what are the real speeds available to the users of this wireless router. 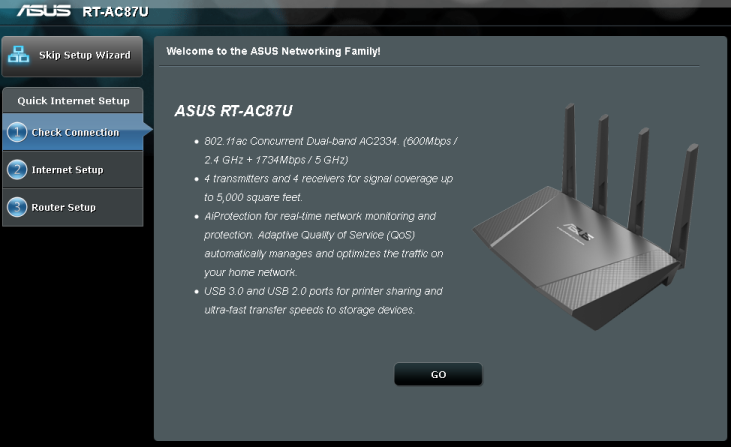 ASUS RT-AC87U wireless router comes in a black plastic case, which is really typical for this kind of devices. The only nontypical thing in it is its size and weight: 290x168x48 mm and 747 grammes. To work properly the device needs an external power unit (included in the box) with the following characteristics: 19V and 2,37А. On the upper surface there is a 3D brand tag as well as subscriptions to the device status LEDs located on the edge between the front and upper panels. The front panel of the model under review has two buttons located on it: LED and Wi-Fi, which are used for enabling/disabling LEDs and Wi-Fi, respectively. Apart from it there is a USB 3.0 port hidden behind a special plate. The bottom side has four rubber legs used for desktop mounting of the device. 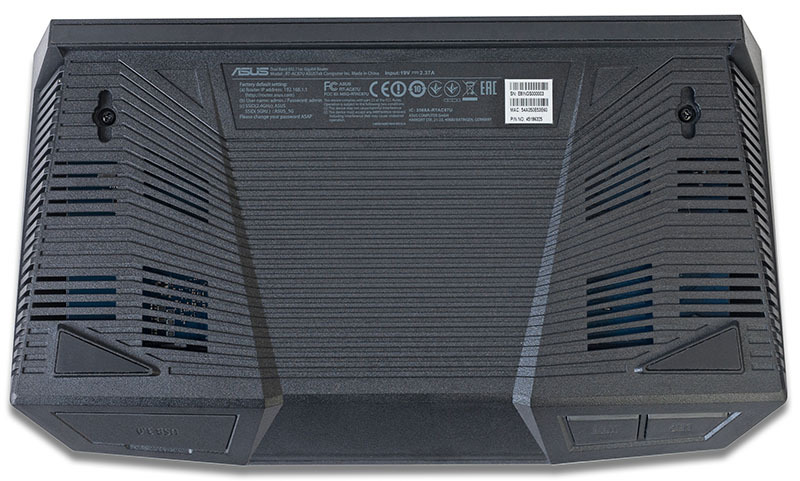 ASUS RT-AC87U can also be hanged onto the wall and therefore it has two mounting holes located on its bottom side. A sticker with the brief information about the model and a ventilation grate are located here, too. The rear panel has sockets used for connection of four external antennae, power socket with a power ON/OFF button, WPS and Reset buttons, and five Gigabit Ethernet interfaces (four LAN and one WAN ports). Now let's have a look at the insides of the ASUS RT-AC87U case. 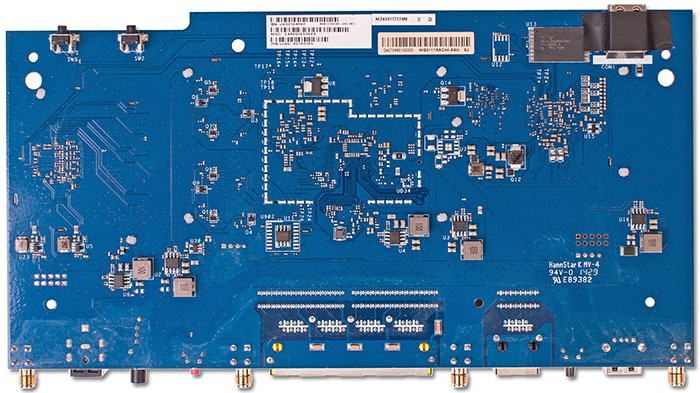 The electronic stuffing of ASUS RT-AC87U wireless router is one textolite card which has all essential elements located on both of its sides. Spansion S34ML01G100TFI00 module with the size of 128 Mbytes performs functions of flash memory. 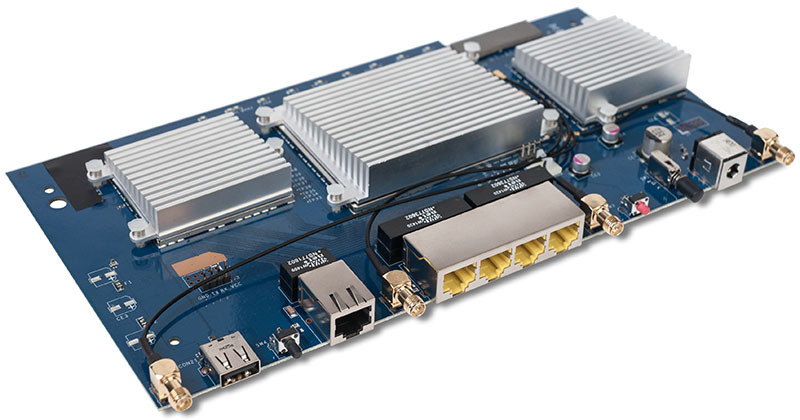 The largest part of the card surface is covered by massive heatsinks. It stands to mention that passive cooling is used in RT-AC87U. However, unfortunately for us, the heatsinks themselves are used to cool metal screens under which there are all other chips located. Therefore, the only thing accessible for inspection is the flash memory module. Information about the CPU and RAM can be obtained via several backhand ways: using the web-interface and command line. An ARMv7 CPU with two cores (2000 BogoMIPS each) is used in the system. That is where we bring the review of hardware components of the device to an end and pass on to examining its software capabilities. 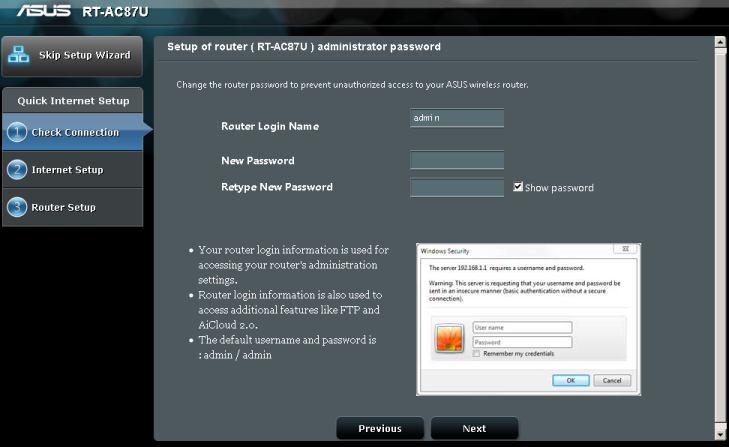 Upon first access to the web-interface of ASUS RT-AC87U wireless router the primary setup wizard will get launched. 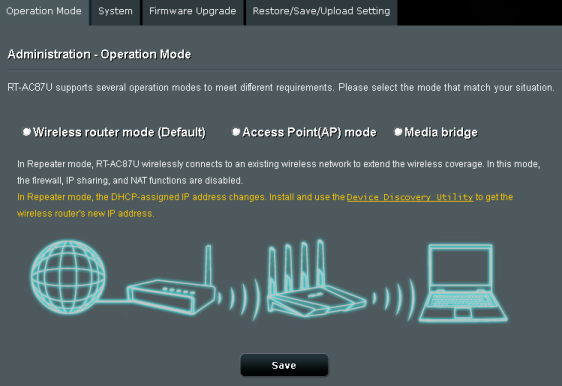 It is used to set the administrator password and specify the main operation parameters of the device: device operation mode, connection type to the service provider, settings of the wireless network. And though the firmware update is not necessary to be carried out in order to prepare RT-AC87U for fully-fledged operation, we strongly recommend all users to do it. Firmware upgrade is carried out in Firmware Upgrade tab, Administration menu item. Firmware upgrade may be carried out both in a manual and semi-automatic mode. In order to perform the latter one needs to be connected to the Internet. Actually, the manual firmware upgrade mode is not that difficult as it only requires a firmware image file that was previously downloaded from the vendor's web server. The whole firmware upgrade process takes about three minutes and does not require any technical proficiency from the administrator. 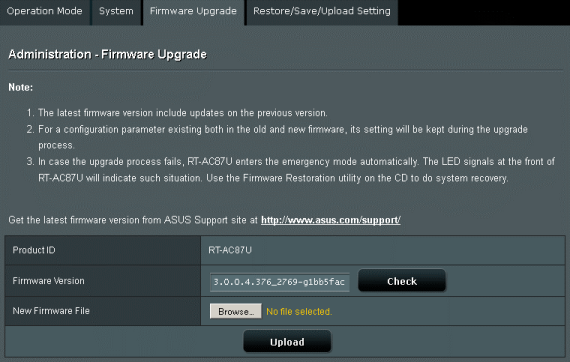 Unfortunately, when this article was being written there were still no utility for firmware restoration (Firmware Restoration) available for ASUS RT-AC87U at the official website. However, this is not a big problem. 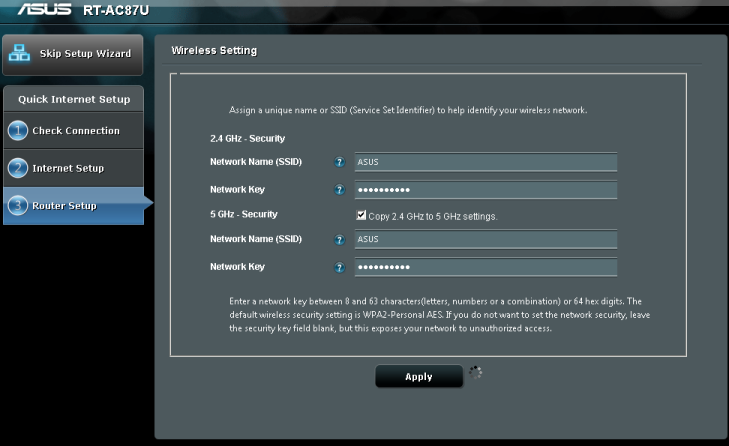 The owner of this device can either use the same utility available for any other ASUS wireless router or restore the device firmware manually. This utility may come in handy if there is a failure during the firmware upgrade process. In this case the device will automatically switch to the restoration mode. Upon manual firmware restoration the administrator can upload the firmware file directly to the router using TFTP. The second method of the manual firmware restoration is uploading the firmware file using the boot-loader web-interface. Also, one can reboot the device or reset user settings here. Slowly flashing power indicator will show that the router changes for the rescue mode. Another thing that may indicate the transition to the rescue mode are changes in TTL field value in retraced ICMP echo replies: TTL=64 in the normal mode and TTL=100 in the restoration mode. 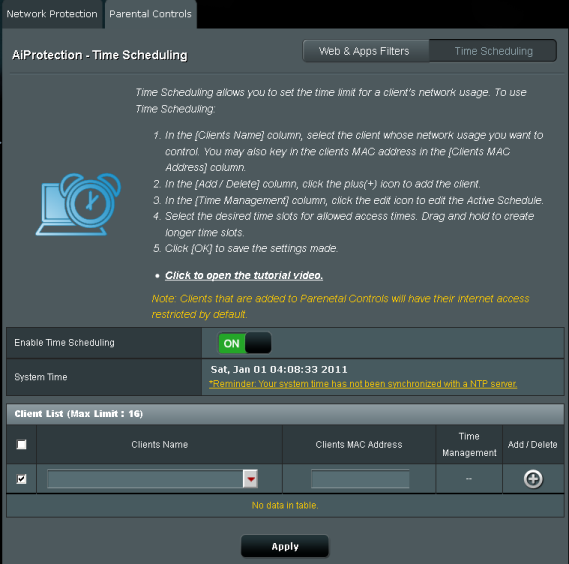 Now let's review the new capabilities of the router web-interface. One can access the device web-interface by entering 192.168.1.1 in any modern browser. It's worth noticing that the web-interface is available in 22 languages. We will not review all capabilities of the RT-AC87U web-interface, since we had already done it before, but only turn our attention to the most interesting features. Network Map menu item shows brief information about the connected clients and availability of access to the Internet. 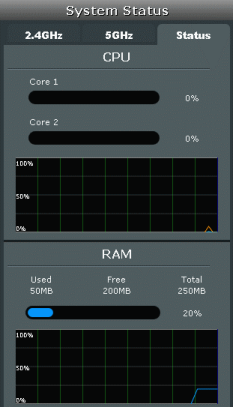 Apart from it, this tab also contains key settings of the wireless network for both frequency ranges and information about the CPU and RAM usage. ASUS company has started collaborating with Trend Micro anti-virus software vendor. 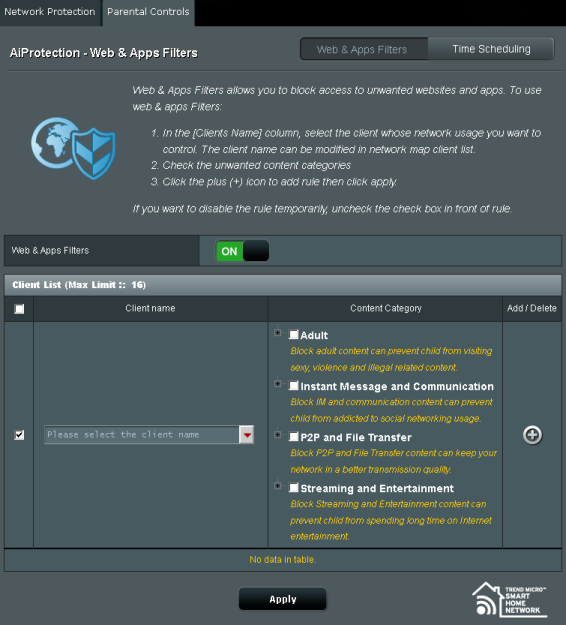 This collaboration resulted in appearance of AiProtection menu item, which provides the router users with network protection and parental control features. 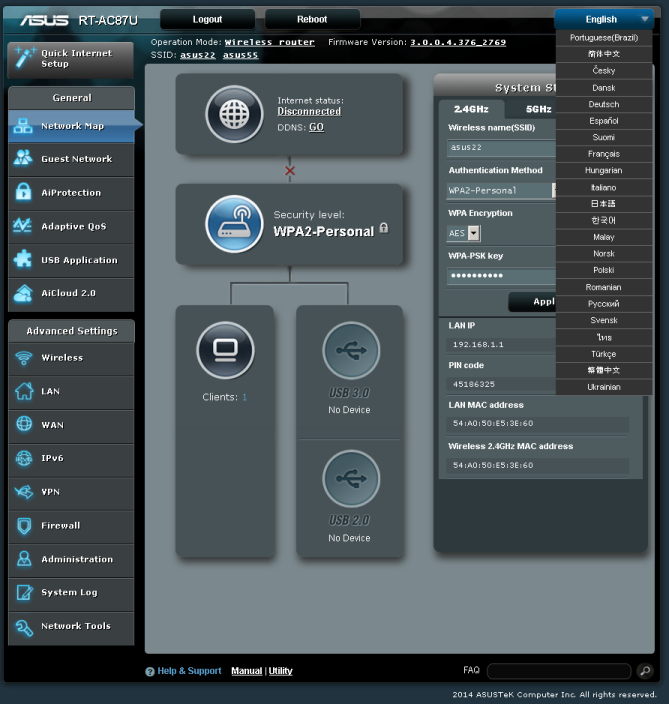 It'd be fair to point out that the parental control feature has been present in the ASUS network equipment earlier too, but nevertheless the other protection features were not available. Parental control lets one place restrictions on the used applications and visited websites for children's devices as well as grant the access to the Internet on schedule. 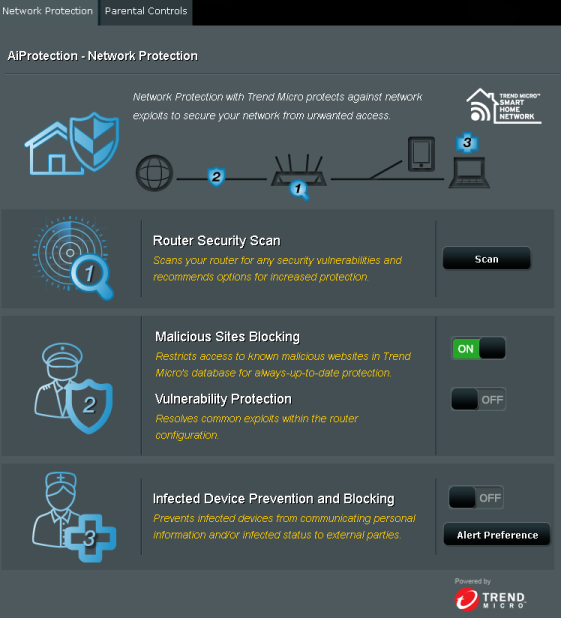 Network protection features are more interesting and include a security test of the router (checking the correctness of settings in terms of security), blocking of malicious websites, attack control, and detection and blocking of infected devices. 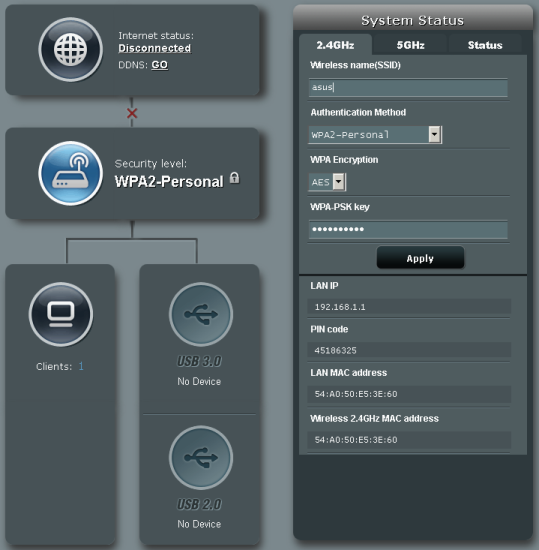 Router Security Scan feature shows settings that are directly associated with security of the router and local network it's connected to. The user can manually activate any security feature that s/he is interested in. 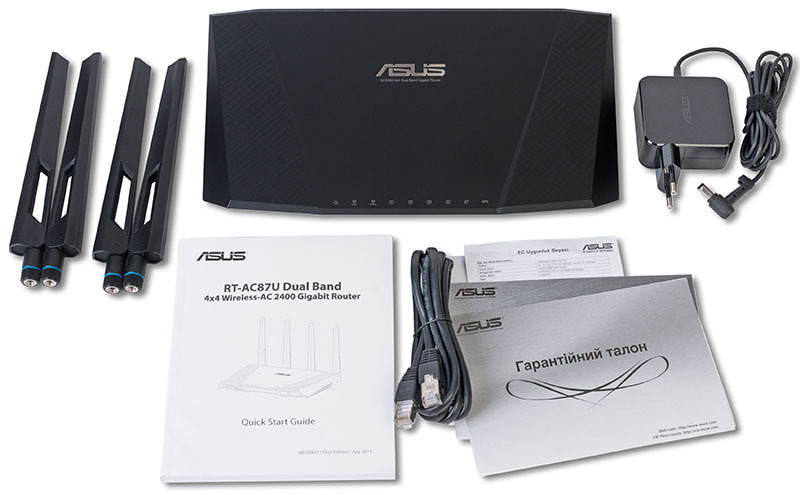 Upon detecting an infected device in the local network, ASUS RT-AC87U wireless router can send the administrator an email notification. Adaptive QoS menu item underwent some changes, too. Now the router can analyse applications (based on the transferred traffic) that are initialized on the user hosts and show their traffic consumption speed using Bandwidth Monitor tab. 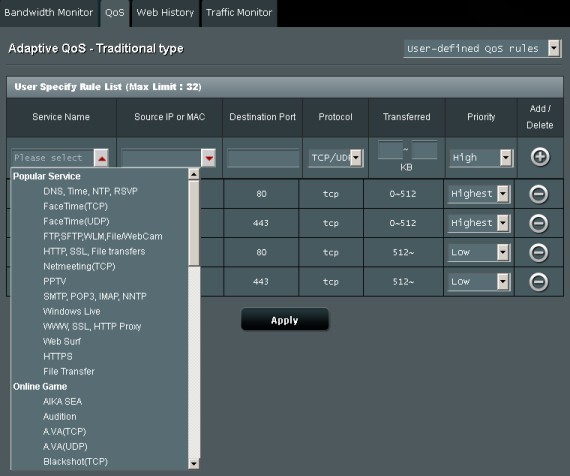 Traffic Monitor tab contains info about the interface utilization during various time periods. 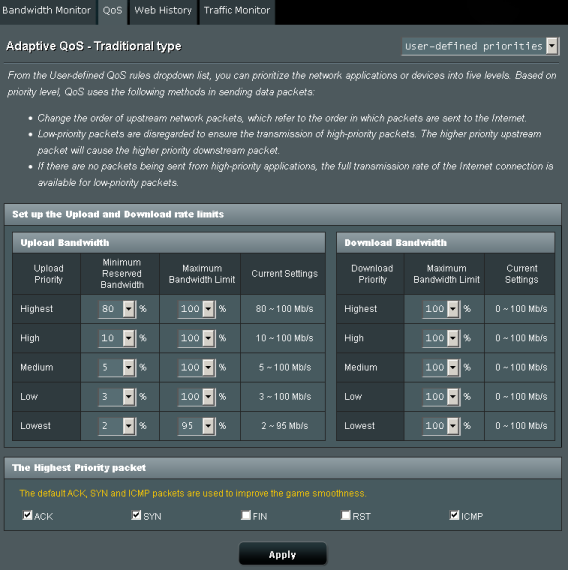 QoS tab lets one carry out either manual or adaptive adjustment of QoS. In the manual adjustment mode the user can specify the bandwidth value—or its priority— required for every application by him/herself. The adaptive mode gives one a possibility to specify priorities for groups of similar applications. The list of websites that the user has visited is located in Web History tab. Switch Control tab in LAN menu item is meant to be used in order to enable and disable support of Jumbo frames as well as for selection of the method of accelerating of NAT translations. 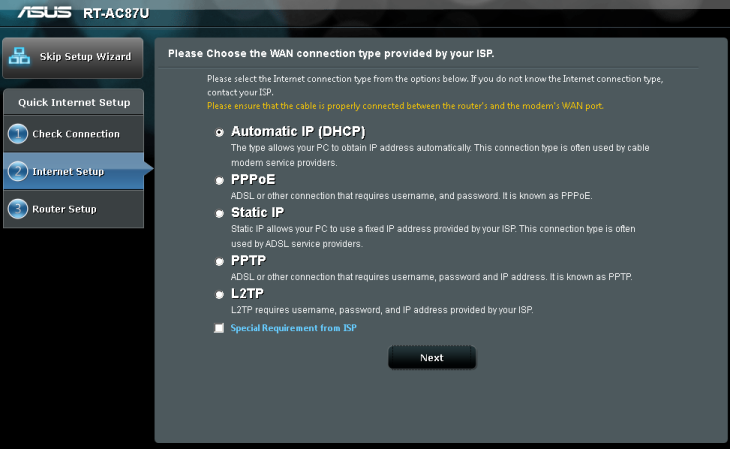 Also, the new firmware versions now provide the users with a possibility to perform automatic reconnection to the server by the VPN client if the connection has been lost. That's where we were about to bring this section to an end, but one thing attracted our attention: absence of the repeater mode in Operation Mode tab, Administration menu item. 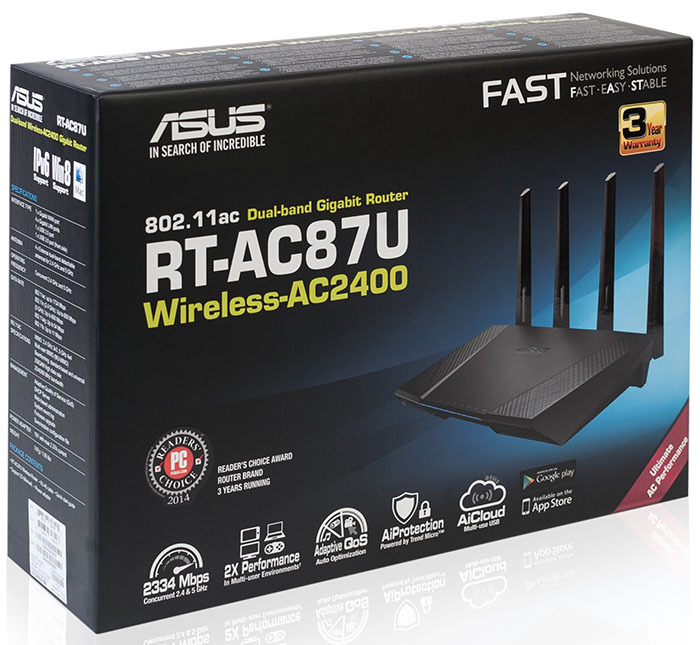 ASUS claims that RT-AC87U model supports three operation modes: wireless router, access point, and Media Bridge, which makes the device perform functions of a wireless client. However, some browsers let the user choose the above-mentioned operation mode. We notified the vendor about this and are expecting it to fix the bug in the next firmware versions. And now let's pass on to reviewing the device command line capabilities. Switching the access to the command line on and off is performed using System tab, Administration menu item in the web-interface. Firmware of the model under review is built on Linux 2.6.36.4 OS using Busy Box 1.17.4. BusyBox v1.17.4 (2014-08-28 16:49:27 CST) multi-call binary. Contents of /bin, /sbin, /usr/bin, and /usr/sbin catalogs, as well as the output of sysinfo utility, are located in a separate file. For example, /sbin catalog contains tcpcheck utility that lets the administrator find out whether a TCP port is open in a certain node. It looks like /rom/Beceem_firmware catalog contains files that are somehow associated with Yota service provider. As a matter of course, we couldn't help but check a recently discovered vulnerability, which is called ShellShock, in Bash framework. 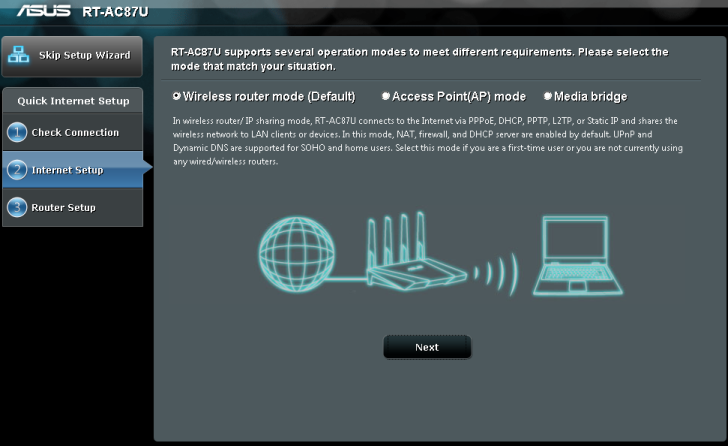 Fortunately, ASUS RT-AC87U wireless router is not exposed to it due to the absence of the pain point of the device, the interpreter. The first testing procedure we usually begin our testing section with is estimating the booting time of the device, which is a time interval starting with the moment when the power is on until the first echo reply is received through ICMP protocol. 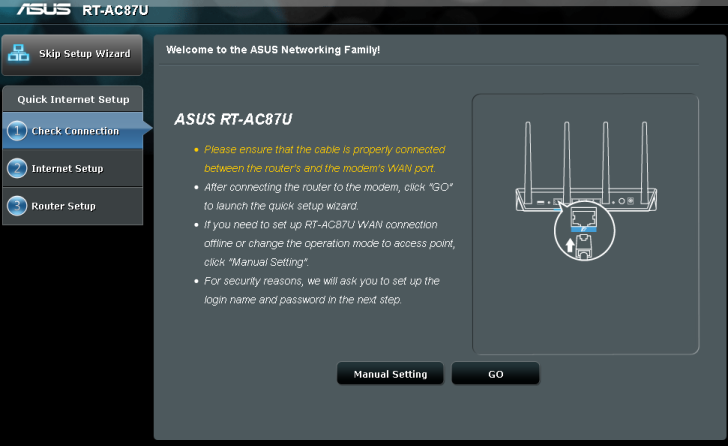 ASUS RT-AC87U wireless router boots in 104 seconds. We believe that this result is decent. The second traditional test was a security scanning procedure, which has been carried out using Positive Technologies XSpider 7.7 (Demo build 3100) utility. On the whole, there were 13 open ports discovered. The most interesting data are presented below. 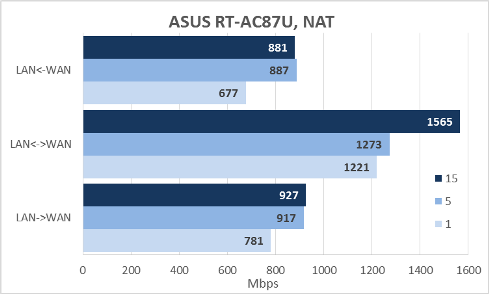 Performance of ASUS RT-AC87U upon carrying out of NAT/PAT translations is presented on the diagram below. It's worth noticing that by default this kind of traffic is processed using hardware acceleration, which prevents applying any load on the device CPU. If one enables carrying out of the translation, or in other words when simple routing of packets is performed, the data transmission will not be done using hardware acceleration but the CPU. 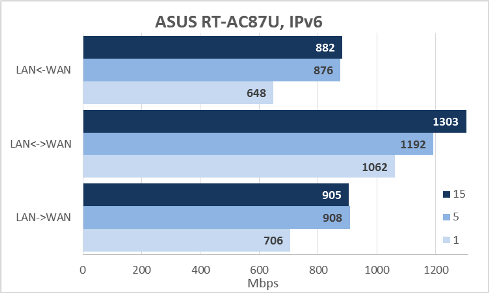 Apart from IPv4 traffic forwarding ASUS RT-AC87U also supports the next version of Internet Protocol, IPv6, which is handled by the CPU. Connection to the provider may be carried using various tunnel types. PPTP, L2TP, and PPPoE. We decided to test PPTP performance. Connection may be established both using MPPE encryption and without it. 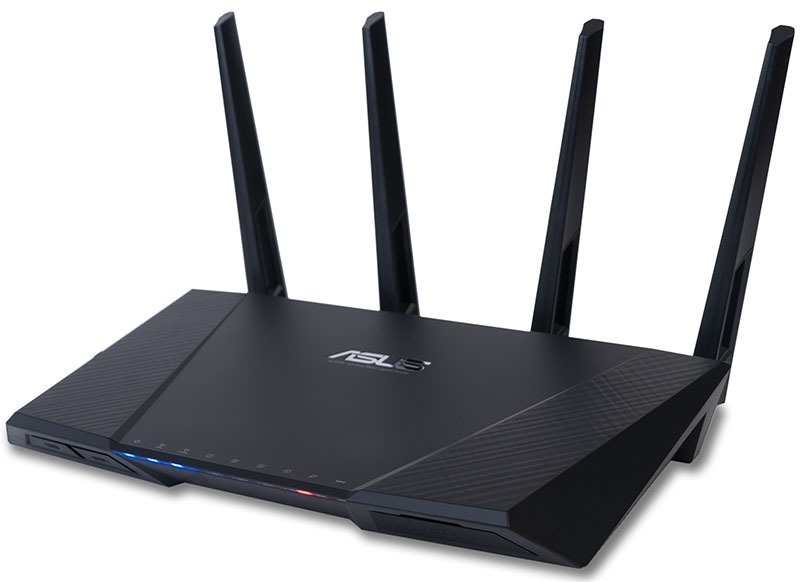 ASUS RT-AC87U wireless router possesses a built-in VPN server of OpenVPN protocol. We just couldn't help but measure speeds of access to the server upon using default settings. One of the most interesting tests is, we dare say, the measurements of performance of the wireless segment. 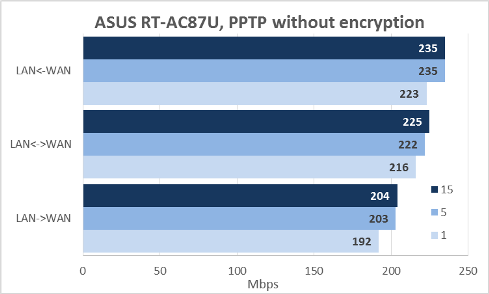 Unfortunately, we didn't have any wireless adapter operating in AC2400 mode in our lab and that's why at first we performed measurements for both of the frequency ranges using ASUS PCE-AC68 network adapter that supports AC1900. We must say that we were pleasantly surprised at the wireless data transmission speeds for 5 GHz frequency range that we obtained. 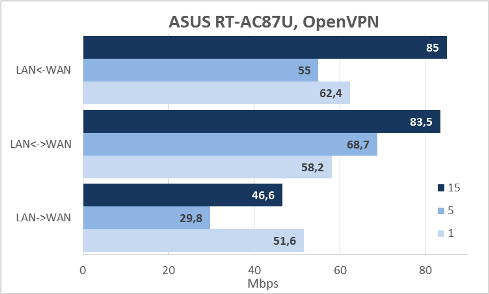 However, we decided not to stop at this point and asked the vendor to provide us with another ASUS RT-AC87U router in order to use it as a client and thoroughly test AC2400. This way we'd probably manage to hit the barrier of 1 Gbps in wireless speeds soon! 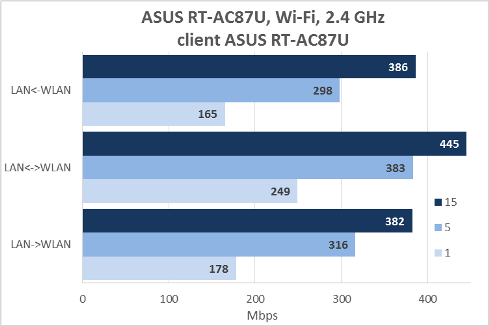 ASUS RT-AC87U wireless router has a USB 2.0 and a USB 3.0 port, which we used to connect a 750 Gbyte Transcend StoreJet 25M3 hard disk successively formatted into four file systems: NTFS, FAT32, and EXT2/3. The results of measurement of access speeds to the disks using SMB protocol are presented below. 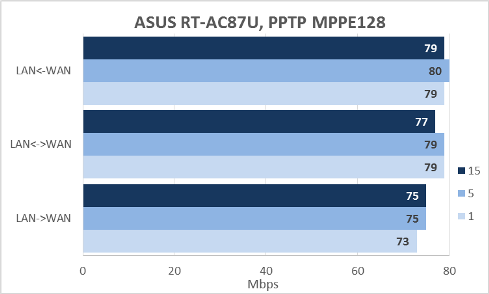 It's also worth mentioning that ASUS RT-AC87U uses passive cooling of its hardware components, or in other words it doesn't have a fan in its case. We decided to measure the temperature of the device case during our performance tests. In order to measure it we used our lab's ADA TempPro-2200 pyrometer. The highest temperature that we managed to measure has been 48,8°С. We believe that the result is decent. 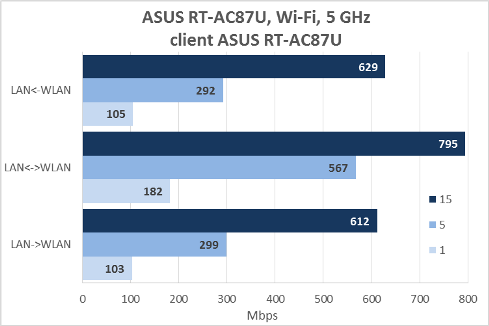 Generally, we are glad about ASUS RT-AC87U wireless router we tested. It allows for performing wireless data transfer at never-before-seen speeds. 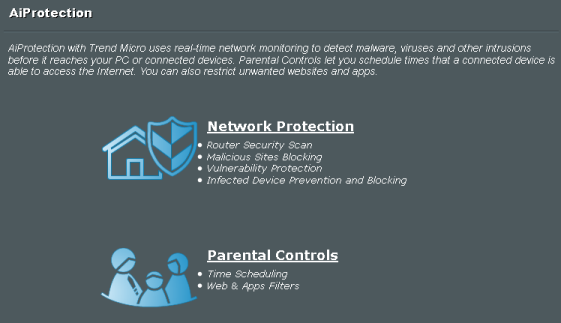 Appearance of user protection features, developed by Trend Micro company, looks like a useful change too. Usage of a powerful CPU will let the users enjoy various network resources to the full. 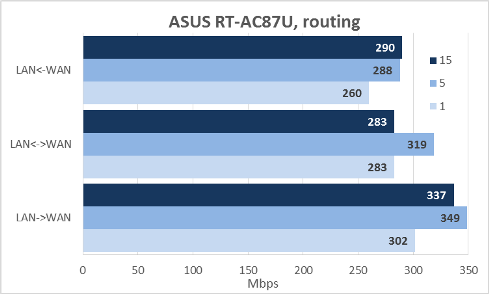 Strength areas of ASUS RT-AC87U are presented below. 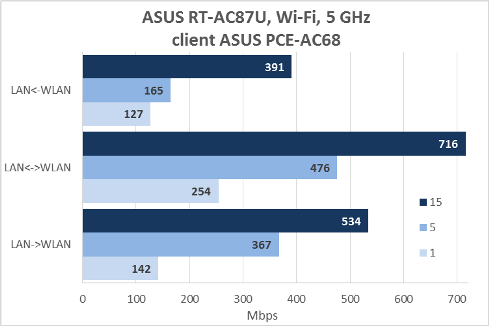 As of when this article was being written, ASUS RT-AC87U was not officially on sale in Moscow. The sales are to start in December 2014. The device will be priced at 9990 roubles.